You do not want mold in your home. You don’t want it on your walls or windows and you don’t want it in your carpet either. Learn how to prevent carpet mold and what causes carpet mold so your home stays healthy for you and your family. The cause of carpet mold is moisture or dampness. Most of the time mold in carpet is found in basements or in rooms with a lot of humidity. You can prevent mold in these situations if you vacuum on a routine basis, run floor fans or ceiling fans, open windows and schedule carpet cleaning Fort Wayne every 12 months. Another common cause for carpet mold is water damage. A burst pipe in your home or an overrun sump pump or any kind of flooding can lead to carpet becoming saturated and soaked in water. You can vacuum some of the water or hire professional restoration services to remove it but you need to act fast. The longer the water sits in the carpet the greater chance for bacteria and mold growth to occur. Wet carpet is the leading reason for there being mold in a carpet. This means you do not want your carpet to be wet. That goes for carpet cleaning too. Too many professional carpet cleaners use gallons and gallons of water for their service. Then their equipment is not able to remove all of the water. The water left behind from steam cleaning and carpet cleaning machines can lead to mold growth or even carpet shrinking. The main reason for scheduling carpet cleaning is for clean and healthy carpets. You definitely don’t want to possibly get carpet mold as a result. Chem-Dry of Fort Wayne carpet cleaning is a great choice because we use 80% less water than traditional methods or steam cleaning. Less water means less chance for mold growth or bacteria in your carpet. The end results is carpet that is dry, clean and healthy. 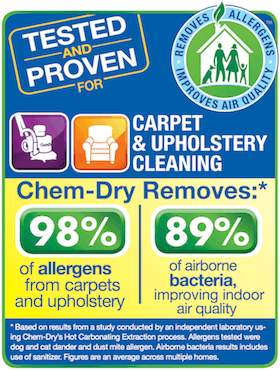 Prevent carpet mold in your home with HEPA filters, ceiling fans or floor fans, air circulation, routine cleaning and vacuuming and of course, scheduling regular appointments with Chem-Dry of Fort Wayne. Call (260) 409-1138 for more information.